Seattle-based Glis was formed by Shaun Frandsen and Andrea Ashdown. 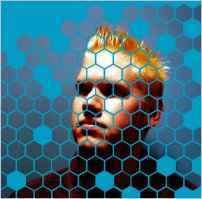 They signed to Alfa Matrix after the release of their first album, "Extract", in 2002. Andrea left after their second album and Shaun continued Glis as a solo project, working with a range of contributors. "Nemesis", released in 2005 and featuring Jean-Luc De Meyer on guest vocals, saw the act change from poppy EBM to a darker, more industrial-influenced sound.